KONG Stuff'N is a tasty paste you can use to fill your dog's KONG toy. Thanks to the delicious paste, your dog will enjoy playing with the KONG for hours. KONG Stuff'N is available for puppies and adult dogs. KONG Stuff'N is a tasty paste that can be used to (re)fill KONG products. 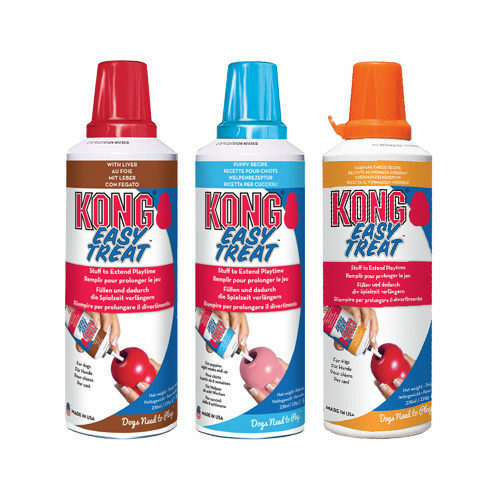 Simply apply the tasty paste to the inside of the KONG toy or onto the grooves of a KONG Dental toy. Your dog will experience hours of playtime fun due to the delicious paste. The special consistence of the paste makes it easy to spray. KONG Stuff'N Liver Easy Treat: Liver flavoured paste, suitable for all dogs. For use with standard KONG toys, such as the KONG Classic and the KONG Extreme. KONG Stuff'N Puppy Easy Treat: Chicken liver flavoured paste, specially designed for puppies, extremely suitable for a puppy's sensitive stomach. For use with KONG Puppy or KONG Puppy Teething Stick. KONG Stuff'N Liver Easy Treat: Milk, water, soya-oil, whey, modified maize starch, sodium phosphate, maltodextrin, dextrose, dried chicken liver, salt, lactic acid, natural taste, sorbic acid (as preservative), cheese cultures, rennet. KONG Stuff'N Cheddar Cheese Easy Treat: milk and by-products (30% cheddar cheese), oils, fats, sugar, organic by-products, minerals. KONG Stuff'N Puppy Easy Treat: Milk, whey, water, soya oil, modified maize starch, sodium phosphate, maltodextrin, dextrose, dried chicken liver, kaolin, salt, lactic acid, pectin, sorbic acid (as preservative) cheese cultures, rennet, natural aroma. Have you used KONG Stuff'N before? Let us know what you think about this product. KONG Stuff Chicken Liver was very tasty for my dog and he loves it when I combined it with the KONG Classic, however be careful to not put too much in it as it can cause diarrhoea.